Country house dogs get to chase rabbits, roll in sheep droppings, bark at cattle, find, bury and dig up disgusting things months later. Their noses can enjoy a great variety of nasal experiences in the paddocks, hay barns and water races on the property. Taj-dog the country house dog could be very old - who knows his age in human years? A few years ago he went a bit grey around the muzzle, but this just made him look more intelligent and thoughtful. 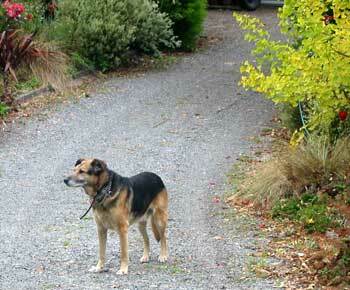 He developed a great sense of responsibility, and took to sitting calmly in the sun at the top of the driveway. For the first time in his life we could trust him not to go off on a dog-cruise somewhere. At last Taj-dog had emerged from puppy-hood into sensible middle age. We were the proud parents of a dog-university graduate. Another year went by, and then Taj-dog started slowing down on the compulsory country bicycle rides. They have traditionally been long but leisurely, allowing him to lope along the large grass verge - plenty of time for rabbit smell investigations and the odd piddle on a post. For the first time the 'round the country block' ride was aborted. Dog was still attempting to zig-zag from side to side, covering at least four times as much mileage as the cyclist. The dog-nose kept going, but the dog-legs petered out into a rather stately slow walk. A rather dishevelled, huffing dog arrived home with a frustrated cyclist. For the return part of the journey positions had been totally reversed, the cyclist wobbling from side to side while the slow dog toddled along in a straight line. After two hours on the purple beanbag the dog tried to stand up, and seemed rather stiff. A visit to the Frisbee Lawn and a thrown stick resulted in no response. 'I think the dog is showing his age' I helpfully suggested. Then the white muzzled Taj-dog went through a rather naughty, juvenile phase. He became very disobedient, ignoring the calling of human pack members, seemingly oblivious that they were in a hurry and needed his attention. He couldn't be bothered barking at the visitors' cars arriving in the driveway. He lost interest in coming for short walks to the letter box. Shouts of 'Would you like to come in the CARRRRRR?' 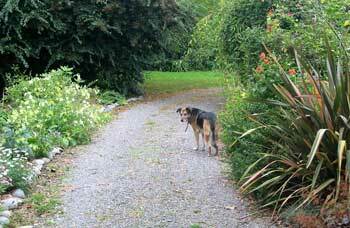 (we are a vocally polite pack) fell on deaf dog-ears as he trotted up the drive in the wrong direction. And deaf dog-ears they were. After days of disappointment and dog-scolding (body language - hands on hips, stern tilt of chin, wagging accusing finger) we realised that he was going deaf. No wonder he seemed to be disobedient - he couldn't hear a word we were saying. Off we went to the vet and back from the vet we came, without a single ear drop. Apparently Taj was healthy and as deaf as the posts he used to piddle on down the road. We lead a quiet life now. If we cycle to the local garage (three kilometers) we take a picnic pack and a book to read. We poke Taj-dog in his dog-ribs a few seconds before a visitor comes into the house, so as not to cause alarm to either party. We drive slowly up the drive. Read my lips, we say, engaging dog-eye contact. No more dog-sticks are thrown and fetched on the Frisbee Lawn. 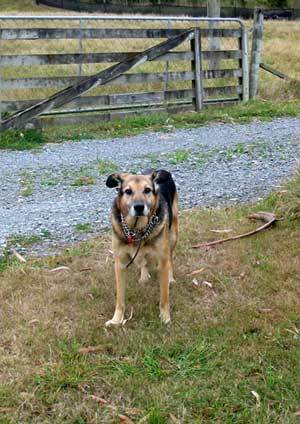 Yes, Taj-dog is now an old dog. 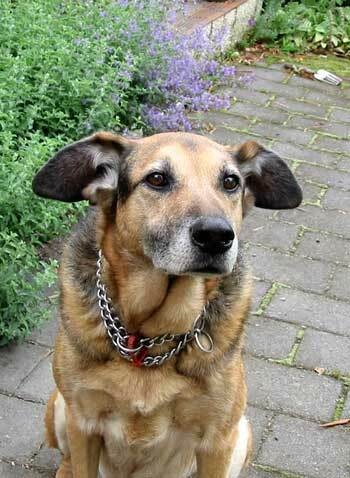 Old Taj-dog passed away peacefully on his purple beanbag in 2004. He has an Almond tree planted as a memorial.